"The Tulsa 20 - In Honor of the People Who Put Tulsa On the Map"
Due to copyright reasons I cannot transcribe this supplement, but I will post bits and pieces of the information found in this supplement. Should you wish the full story on someone please let me know and I will copy it for you. This is the sixth supplement published to celebrate the 100th anniversary of Tulsa. If I can locate some of the other supplements I'll add them. Tulsa Public Schools: On Dec 21, 1897, just five days after the petition to incorporate Tulsa was filed, city father J.M. Hall wrote t the Presbyterian Home Mission Board in New York. He pleaded for continued funding for Tulsa's one room school at Fourth Street and Boston Ave. But the board refused. The school had been set up in fall 1884 to educate American Indian children. But by 1897, as the mission board pointed out, most pupils were white. Tulsa, the board suggested, should start a public school.  So Tulsa did. At a meeting May 29, 1898, the town council adopted an ordinance creating TPS. The University of Tulsa: A string of wildly successful football seasons early this century built up community pride in Kendall College. And the pride led to calls for the college to change its name to something that would tell everyone where that great school was from. So, in 1921, Kendall became TU. The private school had moved to Tulsa from Muskogee in 1907, setting up at what was then the eastern edge of the city where the 11th Street Trolley ended, near Delaware Avenue. B'nai Emunah: The small group that went on to form Tulsa's Conservative Jewish congregation, were meeting in homes as early as 1909. The congregation built the first synagogue in 1916 and moved to its present location at 17th Street and Peoria Ave in 1942. Boston Avenue United Methodist Church: The Rev E B Chenoweth rode into town, with his wife and infant son, from Colorado in 1893. His congregation first worshiped in a brush arbor near the Frisco Railroad tracks, and later in a simple frame building. The art deco landmark at 1301 S. Boston Ave wasn't built until 1929. Central Assembly of God Church: The Rev Charles Parham started the Pentecostal revival in 1901 at his charismatic meetings in Topeka, Kan. And Vandalia Fry was there. Then she moved to Tulsa in 1905, lured by the great Glenn Pool oil strike, and invited Parham to bring his revival to her new hometown. He came the next year and formed a small congregation that began meeting regularly at Fry's home. It grew steadily, and by 1912 had settled at Fifth Street and Peoria Ave. Now known as Central Assembly, the congregation found a new home in the 1990s at 4821 S 72nd E Ave. The First Baptist Church of Tulsa: Baptist evangelist Elihu Lee formed a Tulsa congregation in 1887 and members built a church for themselves the next year. The congregation grew into one of Tulsa's largest, now located at Fourth Street and Denver Avenue and affiliated with the Southern Baptist Convention. First Baptist Church - North Tulsa: The city got its first predominantly black church congregation in 1899. First known as the Macedonia Baptist Church, it evolved into First Baptist-North and moved in to its present building on North Greenwood Ave in 1953. First Christian Church (Disciples of Christ): Eighteen people formed this congregation in a living room in 1902. The congregation built a church the next year and its present building at Ninth Street and Boulder Ave, dates from 1918. First United Methodist Church: Members of an overly excited congregation at a Christmas program in 1888 started firing pistols into the air. So the minister's wife walked up and down the aisles, demanding that all guns be tossed into her outstretched apron. First United Methodist Church, now at 1115 S. Boulder Ave., was just 1 year old at the time and under the leadership of the Rev. George Mowbray. It's now one of the largest Methodist congregations in the country. First Presbyterian Church: A visiting Presbyterian minister, the Rev Robert Loughridge, delivered what apparently was the first sermon ever preached in Tulsa. He spoke from the steps of J M Hall's general store at First and Main Streets and he had to struggle to be heard over the jeers coming from gamblers in nearby tents. Two years later, in 1885, the Rev William Penn Haworth took up the cause and started the first congregation in Tulsa. The first services were in the one-room Presbyterian Mission School at Fourth Street and Boston Ave, just about where the Philtower now stands. First Presbyterian, now at Seventh Street and Boston Ave, has since grown into one of the largest Presbyterian congregations in the country. Holy Family Cathedral: Tulsa's Roman Catholic cathedral didn't really become a cathedral - the seat of a bishop - until Monsignor Bernard J. Ganter was installed as the city's first prelate on Feb. 7, 1983. .... But the Holy Family parish had been around since 1899, when Tulsa's first Catholic congregation took the name. Members had been worshipping in private homes for years before. The current church was built in 1913, and for years it was the tallest landmark in the skyline. Temple Israel: Tulsa's first Jewish congregation met in rooms of the Tulsa Chamber of Commerce in 1914. ....[located at] 14th Street and Cheyenne Ave.
Trinity Episcopal Church: In 1903, the first Episcopal priest to visit Tulsa, the Rev Everett Williams, found only two communicants. But just two years later, in 1905, the congregation had grown large enough to build a neo-gothic church at Fifth Street and Cincinnati Ave.
Bank of Oklahoma: Formed in 1910 as Exchange National Bank of Tulsa, it was started by Harry Sinclair and other oilmen, as a way to finance the upstart energy business. It built a 12 story building at Third Street and Boston Ave in 1917. ... The bank became National Bank of Tulsa in 1933. .. The bank changed it's name to Bank of Oklahoma in 1975. In 1976, the 52 story BOK Tower opened, which at the time was the tallest building in the state. Bays National Security: The company's first job in 1883 was chasing cattle rustlers and other outlaws across Indian Territory and hauling them into "Hanging Judge" Parker's court in Ft. Smith, Ark. But Bays National Security soon lived up to its name and went national. By the end of the decade, Bays undercover agents had infiltrated the deadly outlaw gang called 'The Molly Maguires." Their testimony led to the hanging of 12 ring leaders. And Bays soon got into the business of guarding valuables, too. In the days before banks came to the Tulsa area, merchants and cattlemen made deposits into Bays' vault, guarded 24 hours a day. And Bays, 3635 S. Sherdian Road, is still guarding valuables 24 hours a day, every day all year. The Blossom Shoppe: Established in 1905. Was once located downtown. Burkhart's: Began in 1904 as the Tulsa OK Press, the former printing department of the Tulsa World [newspaper]. It was located in an alley near Third and Main Streets. ... Robert Schofield bought the business in 1906 .... published the first city directory in 1907. Richard Willis Burkhart bought the company in 1908. ... The company has evolved into a chain of office supply stores. Mrs. DeHaven's Flower Shop: Established in 1905 by Mrs. Perry DeHaven in the corner of Nell Shields Jackson's lady clothing store to sell flowers to the newly rich oil baronesses. Now located at: 106 E 15th Street ... Notable clients have included Ringo Starr, Julie Andrews, Tom Brokaw, Francis Ford Coppola and Nelson Eddy. Ike's Chili: On the 1966 TV game show "What's my Line?" actress Peggy Cass answered the question about who makes the most famous chili in the world. "Ike's out in Tulsa, that's who," Cass said. "And, I got some in my freezer right now." Of course, Ike's Chili - served up since 1908 - had some big help becoming that famous. Will Rogers liked to eat there and he liked to tell people about it too. The secret recipe has remained unchanged since 1908 and can be found in Tulsa. Rhodes Insurance: Began in 1903 and was purchased by John McLemore in 1954 when the name was changed to McLemore Insurance Agency. Mrs. Jackson's: Nelle Jackson opened in 1905 on the balcony of a downtown jewelry store. Today the business is located in fashionable Utica Square. Palace Office Supply: James and Olive Constantine founded this business in 1909 and 3 generations later, it is still family owned and operated. OK Machine & Manufacturing: Joseph Stroble created OK on Sep 24, 1904. Still family owned and operated. PennWell Publishing Co: Begun in 1910 by Patrick Boyle to publish the Oil & Gas Journal. Now puts out over 30 magazines. Renberg's: Started by Sam Renberg at 116 S. Main St in 1913 is a top of the line clothier. Sheehan Piple Line Construction Co: Laying pipelines from Independence, Kan, to Drumright and Cushing, work crews in 1904 had to rely on Tulsa as a place to pick up supplies, including horses, wagons, tents, shovels, picks and enough food for 100 men. By 1910, Sheehan decided it might as well just move to Tulsa. It did and has been here ever since. Southern Sheet Metal Works: Established in 1904 it's the oldest sheet metal fabricator in Oklahoma. Stanley Funeral Home: Established in 1909 by George Stanley, pioneer who came to Tulsa in 1905. It was the first to use motor equipment in 1914 and the first to build a funeral home. Tulsa World: The first edition was published Sep 14, 1905. The newspaper was originally planned as a weekly, but the owners - J R Brady and James F McCoy - suddenly changed it to a daily because oil fever hit the town of 2,500 people. Tulsa Tribune: The daily evening paper in Tulsa from 1920 until 1992. It merged with the Tulsa World in 1992. White Line Inc. Frank White quit his job managing a stagecoach line between El Reno and Elk City and moved to Tulsa in 1905. Right away he started The White Line, the city's first taxi service. It had 10 horse-drawn carriages and a few bus wagons, which used coal-burning lamps for headlights. The company now operates, Yellow Cab, checker Cab and Airport Cab. Tulsa Red Cross: Founded in 1906 as the Indian Territory Branch of Red Cross, the organization included the chiefs of the Five Civilized Tribes as an honorary board of directors. Akdar Shrine Temple: Art deco and Byzantine architecture met at the intersection of Fourth Street and Denver Ave. That's where the Akdar Shrine built its headquarters in the early 1920s. The local shriners had been charted since Jul 12, 1911. American Association of University Women: 10 Tulsa women came in answer to a 1918 newspaper ad to the first branch of the American Collegiate Association. Camp Fire Girls: Eunice Robards formed the first group in Tulsa in 1912. Children's Day Nursery: Still in operation - it was founded by 16 Tulsa women, headed by Mrs. Frank B. Shallenberger, in 1915 to serve the children of the poor working families. Hyechka Club of Tulsa: Jane Heard Clinton was a socialite, raised in Elberton, GA., where her father was mayor. Her beautiful voice and well-trained skill at the piano made her a star in social circles from St. Louis to Washington DC. So when her new husband, Dr. Fred Clinton, brought her to the frontier town of Tulsa in 1897, the lifestyle didn't exactly suit her. She helped alleviate the lack of culture here by rounding up nine other musicians in 1904 and having a meeting above a downtown drug store. Together they started a music club to stir up culture and the social scene. The name Hyechka was suggested by a pioneer missionary with the Creek Nation. Pronounced hi-yeech-ka, it is the Creek word for music. The club remains active today. Knights of Pythias: National organization founded in 1864 in Washington DC. Tulsa chapter formed Jan 11, 1905 named Knights of Pythias Silver Plume Lodge No 182. Metropolitan Tulsa Chamber of Commerce: Formed in 1902 as the Commercial Club to coordinate efforts to lure more business to Tulsa. In 1915 the name was changed to Tulsa Chamber of Commerce. National Council of Jewish Women: Helen Rosenstein and Nona Bloch Soloman, along with 23 other Jewish women in Tulsa, formed the local chapter in 1917. They installed Mrs. Julius Fohs as its first president. .... In 1929, Mrs. Mae Trope and Mrs. Sara Lewis began a fund to buy milk for poor children. The Piano Study Group: begun in 1915 by Clara Josey Acosta for the development of the highest standard of musicianship. ..... In the 1930s the group presented concerts in which 12 or 13 pianos played simultaneously under the direction of Wilhelm Schmidt. Salvation Army: Tulsa was invaded in 1906 by the first charity organization in town. With the Mabee Boys and Girls Club on north Harvard and the Project Able job training program, the Saalvation Army continues to serve the community. Sons of the American Revolution: The group began in Mar 1, 1909 with James Monroe Hall, a banker who was one of Tulsa's first settlers, as one of its first members. It was chartered Jun 2, 1916. Sons of Confederate Veterans: Tulsa pioneers W Tate Brady and Merritt J Glass called the first local meeting of the Confederate Sons at the Brady Hotel on Feb 12, 1908. More than 100 men joined. The group help establish the State Confederate Veterans' Home in Admore in 1911. The local group hosted the National Convention in 1918 with more than 40,000 people attending. Tulsa Boys' Home: In the early 1900s, it was not unusual to find homeless adolescents sleeping in vacant buildings or alleys. So some leading citizens called on C E Buchner, secretary of the YMCA, to find a solution. He formed a committee and ... the Tulsa Boys' Home was opened on Aug 28, 1918. Tulsa Press Club. Sprang from an organization formed in 1906 "to make the path of newspaper men more beautiful and to provide a little fun on the side". The club was chartered in 1932 and has survived a fire, floods, a robbery, a bombing and a police raid. Tulsa Business and Professional Women's Club: Founded in 1919 as the Business Girl's club of Tulsa, but the name was changed shortly thereafter. United Daughters of the Confederacy: Formed with 14 members in 1909. YWCA of Tulsa: A group of civic-minded women organized the Tulsa "YW" in 1914 to provide a safe place for young women to gather and live.